Metha-Quad Extreme is a test booster capable of delivering its intense anabolic effects using a 4-stack formula to provide the most muscle gains and reduction of body fat. The strongest prohormone formula in the last decade is back and is stronger and better than ever. The once 3-stack anabolic combo has been redesigned to become a 4-stack action combo with a 99% absorption rate. Let’s get on with a more in-depth discussion about the ingredient list, mode of action, and side effects of taking this prohormone supplement. We will also find out about the reception from the product users review. The newly reformulated Metha-Quad Extreme boasts a potent combination of anabolic derivatives that will help in maximizing muscle building & strength gains that you cannot find anywhere else. The dream stack bodybuilders have always been searching is now a reality. Blackstone Labs, its manufacturer claims that most products work by stacking two or even three of these ingredients together to result in a great physique. Metha-Quad Extreme uses four powerful ingredients to combine and achieve a powerful phenomenon. In the past testosterone derivatives were poorly absorbed by the body due to various processes like digestion that greatly decreases the amount it sends through the bloodstream. A new sophisticated delivery system called Liposomal Delivery is used today to make sure that there is a 99% absorption of test boosters in cells. Metha-Quad Extreme is a test booster capable of delivering its intense anabolic effects from powerful, naturally occurring, legal DHEA derivatives. These cutting-edge prohormone compounds provide the body with intense myotropic growth via enhancement of key bodily processes shown to upregulate Androgen Receptor activation, protein synthesis, and nitrogen retention. The synergistic capabilities of Metha-Quad Extreme are unmatched, putting your body into hyperdrive with no other option but to grow, get stronger, and leave everyone in the dust. Also known as 3-Alpha-Hydroxyetioallocholan-17-One, is a powerful legal prohormone which converts to Stanolone. Androsterone users will experience pronounced strength increases and a reduction in body fat. 1-androstene-3b-ol,17-one is a unique precursor to a powerful testosterone derivative known as 1-testosterone. 1-Testosterone has an anabolic to androgenic ratio of 200/100, which is superior to the natural testosterone your body produces! Users of 1-DHEA report increase in lean hard muscle mass, rapid strength gains with many users reporting a hardening effect and an increase in vascularity. 4-androstene-3b-ol, 17-one is a naturally occurring DHEA isomer. This increased anabolic potency and reduced thermogenic action lead to noticeable gains in strength, muscle tissue growth, and lean weight gain. 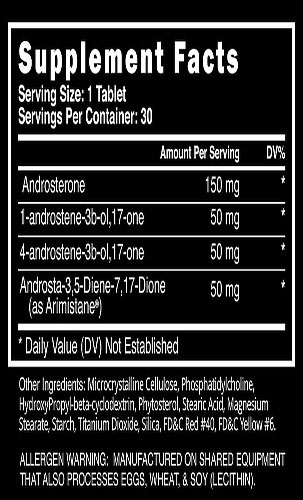 Androst 3,5-diene-7,17-dione dramatically reduces estrogen and anti-myotropic cortisol levels. Arimistane will elevate the user’s natural myotropic state, leading to more muscle mass, better recovery, decreased fat storage, and increased libido! The first effects users notice is a drying out and hardening effect, showing increases in vascularity and increased definition. Unlike other aromatase inhibitors, it won’t give you sore joints from dryness or kill your sexual performance. Other ingredients in this product are Phosphatidylcholine, Microcrystalline Cellulose, HydroxyPropyl-beta-cyclodextrin, Magnesium, Stearate, Starch, Titanium Dioxide, Silica, Phytosterol, Stearic Acid and more. Liver damage – The liver is the organ responsible for converting the chemicals that get into the body. The stronger the chemical, the harder will the liver work. Hair loss – An effect of prohormones is hair loss due to the disruption of the follicular growth, which is influenced by hormones. Acne – This is basically due to hormonal interruption and disruption. Cardiovascular disease – Increased metabolism brought about by unnatural means will lead to overworking of the heart and may affect the arteries and veins. Always consult your doctor and undergo a lot of blood test to check your system organ functions. Follow the recommended dose and practice on-cycle and post-cycle therapies. Being a prohormone user for a decade now, I got intrigued and tried Metha Quad Extreme. I use other powerful products on a regular basis but wanted to put this to the test. And what can I say…I loved it. I gained almost 15lbs – not sure if it is about my genes. Solid gains in lifts all around. This is the strongest stuff I have used since Bold from iForce back in the day. Not recommended for the weak though. Take some liver supplements along with this stuff. This formula is super strong. Recommended for Advanced Lifters Only! This is the strongest prohormone I have taken to date and I have tried other super strong brands out there but most gains came from this one though. I hit my pr in every lift in only 2 weeks…and I swear I gained almost 10lbs over the past 2 weeks alone. Now I am taking cycle support like a ritual because this stuff has a lot of ingredients and I want to stay safe. I picked up Taurine too because I got some nasty back pumps. Not sure how the next couple weeks will go but I am excited about it! This is a prohormone with actions that go beyond the natural process of gaining muscle mass, making it one of the most powerful muscle-building supplemenst today. Extra caution is highly advised for the users of Metha-Quad Extreme. It is also very expensive but considering the gains one can get out of it, it may still be worth it. Helps gain muscle mass in less time. Muscles developed are lean and strong. Also improve muscle recovery and endurance. Post cycle therapy a must. Conclusion: Is Metha-Quad Extreme Worth Buying? This is a sort of rebooted version of Metha-Quad Extreme but with a more versatile and potent prohormone combination that may induce far more benefits than its original version. Bodybuilders and fitness enthusiasts can potentially improve athletic performance, increase muscle strength and endurance, help maintain muscle mass and build muscle and other tissues. In addition, this muscle building dietary supplement is a safe, legal, powerful alternative and beneficial for consumers who are looking to increase anabolic ratio. Metha-Quad Extreme can be purchased from their website or from accredited and trusted retailers online. You can purchase Metha-Quad Extreme by clicking here. Also known as 3-Alpha-Hydroxyetioallocholan-17-One, is a powerful legal prohormone which converts to Stanolone. Androsterone does not convert to estrogen and exhibits anti-estrogenic effects. This allows Androsterone to assist in combatting estrogenic side effects when stacked with other compounds. Due to the strong androgenic and anti-estrogenic effects of Androsterone users will experience pronounced strength increases and a reduction in body fat. 1-androstene-3b-ol,17-one is a unique precursor to a powerful testosterone derivative known as 1-testosterone. It isn't the exact version of natural testosterone produced in the body but differs from actual testosterone only by a double bond isomer. 1-Testosterone has an anabolic to androgenic ratio of 200/100, which is superior to the natural testosterone your body produces! 4-androstene-3b-ol, 17-one is a naturally occurring DHEA isomer. Its structure closely resembles regular DHEA but the double bond is in the 4th position, which dramatically changes its effects. 4-Andro may be the strongest of the all the 4 series compounds. 4-DHEA requires a (2) step conversion process involving 3b-HSD and 17b-HSD to convert it to both Androstenedione and Androstenediol respectively, and then to Testosterone. 4- Andro readily converts to 4-androstenediol, rather than 5-androstenediol, boosting its anabolic potency several times more than regular DHEA. 4-Andro is also expected to have a higher conversion rate to testosterone compared to regular DHEA. This increased anabolic potency and reduced thermogenic action lead to noticeable gains in strength, muscle tissue growth, and lean weight gain. Androst 3,5-diene-7,17-dione dramatically reduces estrogen and anti-myotropic cortisol levels. Experience all of the benefits from an increase in testosterone and reduction of high levels of estrogen and cortisol. Arimistane is a natural compound that is a downstream metabolite of DHEA that exists naturally in the body. Arimistane will elevate the user’s natural myotropic state, leading to more muscle mass, better recovery, decreased fat storage, and increased libido! Hair loss – An effect of prohormones is hair loss. This is due to the disruption of the follicular growth, a process which is influenced by hormones. Does this product require a PCT and on-cycle support? Yes, all prohormones will need both PCT and on-cycle support. Metha Quad Extreme is only recommended for adults aged 21 and above. The recommended maximum cycle is strictly at 12 weeks due to its ability to stack with other compounds. An on-cycle therapy followed by post-cycle therapy is strictly required. 1 tab daily taken with or without meals.